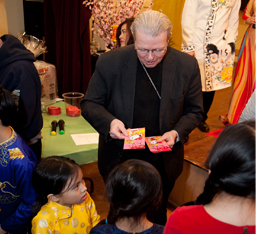 Bishop Edward B. Scharfenberger hands out ‘Lucky Money,’ a traditional gift for children celebrating the Vietnamese New Year. Father Quy Vo welcomes the congregation. 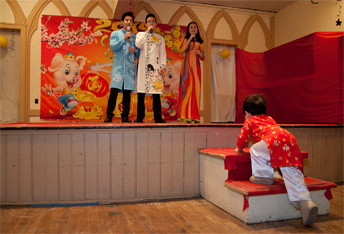 Hellena Nguyen, two, wants to join Jonathan, Joseph and Jovanna D'Alonzo on stage during the Tet celebration. Hung Tran and Thi Cuong lead the procession. 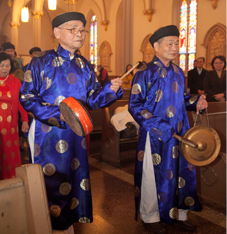 Bishop Edward B. Scharfenberger joined Father Quy Vo and the Vietnamese community at Sacred Heart parish in Albany on Feb. 3 to help celebrate “Tet,” the Vietnamese New Year. 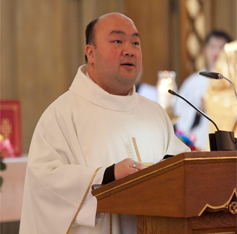 Father Vo, who serves year-round at St. John the Baptist and Sts. Anthony and Joseph in Herkimer County, celebrates a monthly Mass in Vietnamese at the parish, although Sunday’s Mass was a bilingual celebration.